Ana Teresa Fernández, born in 1981 in Tampico, Mexico, lives and works in San Francisco. Her work explores the politics of intersectionality through time-based actions and social gestures, translated into masterful oil paintings, installations and videos. Within her work, performance becomes a tool for investigation as strong feminist undercurrents flow together with post-colonial rhetoric. Through her work, the artist illuminates the psychological and physical barriers that define gender, race, and class in Western society and the global south. Fernández has exhibited at the Denver Art Museum, Denver, CO, the Nevada Museum of Art, Reno, NV, Arizona State University Art Museum, Phoenix, AZ, the Grunwald Gallery at Indiana University, Bloomington, IN, Humboldt State University, Eureka, CA; the Tijuana Biennial, Tijuana, Mexico; Snite Museum at Notre Dame University, Notre Dame, IN; Yerba Buena Center for the Arts, San Francisco, CA and The Oakland Art Museum, Oakland, CA. Her work has been collected by institutions such the Denver Art Museum, the Nevada Museum of Art, and Kadist Art Foundation. The Headlands Center for the Arts granted Fernández the Tournesol Award in 2008 and her films have been screened at festivals internationally including, but not limited to, MADRID International Film Festival, Madrid, Spain, Claremont Film Festival, Claremont-Ferrand, France, the International Frauen Film Festival, Dortmund, Germany, the Female Eye Film Festival, Toronto, Canada, the San Diego Latino Film Festival, San Diego, CA, and the Honolulu Film Festival, Honolulu, HI. Gallery Wendi Norris’ presented a solo exhibition of her work in Miami titled, “Of Bodies and Borders” in November 2019, which traveled to the Grunwald Gallery at Indiana University Bloomington and was accompanied by a publication. 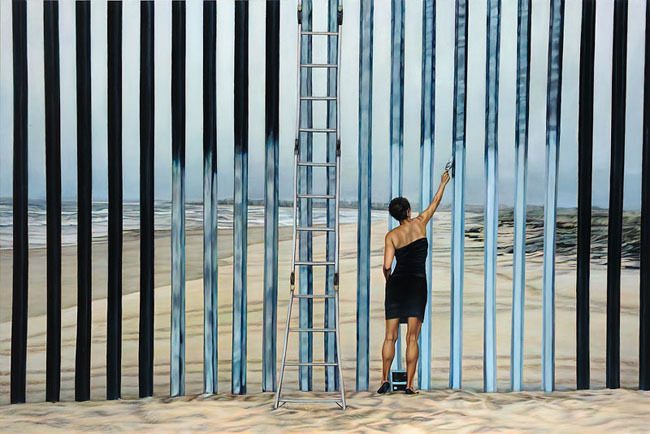 Artist Ana Teresa Fernández Discusses "Erasure"
Can One Artist’s Work Prompt Conversations About Border Politics? Exhibition catalog with essay by María Elena Ortiz, Associate Curator at the Pérez Art Museum Miami. Published by Grunwald Gallery of Art, Indiana University.